Intrarenal changes in cytoplasmic calcium levels have a key role in determining pathologic and pharmacologic responses in major kidney diseases. However, cell-specific delivery of calcium-sensitive probes in vivo remains problematic. We generated a transgenic rat stably expressing the green fluorescent protein-calmodulin–based genetically encoded calcium indicator (GCaMP2) predominantly in the kidney proximal tubules. The transposon-based method used allowed the generation of homozygous transgenic rats containing one copy of the transgene per allele with a defined insertion pattern, without genetic or phenotypic alterations. We applied in vitro confocal and in vivo two-photon microscopy to examine basal calcium levels and ligand- and drug-induced alterations in these levels in proximal tubular epithelial cells. Notably, renal ischemia induced a transient increase in cellular calcium, and reperfusion resulted in a secondary calcium load, which was significantly decreased by systemic administration of specific blockers of the angiotensin receptor and the Na-Ca exchanger. The parallel examination of in vivo cellular calcium dynamics and renal circulation by fluorescent probes opens new possibilities for physiologic and pharmacologic investigations. The mammalian kidney is a highly complex organ, and physiologic and pharmacologic modulation of intrarenal calcium homeostasis has hardly been explored yet.1–3 Proximal tubular epithelial (PTE) cells are among the cell types most sensitive to ischemia and nephrotoxicity. Cellular calcium changes are key players in these responses; thus, exploration of cellular mechanisms underlying the pathophysiology of kidney injuries would have an utmost importance in drug development and the treatment of kidney diseases. Calcium-dependent mechanisms in ischemia-reperfusion lead in many cases to irreversible cellular damage.4,5 Therefore, a better understanding of these mechanisms is essential to improve outcome for kidney transplantations. In vivo cellular calcium dynamics studies are greatly hindered by the difficulty of delivering calcium-sensitive probes to specific cells. This problem may be avoided by a targeted, stable expression of fluorescent sensor protein chimeras, enabling quantitative evaluation of cellular calcium dynamics. Recent developments in two-photon microscopy, allowing analysis of rapid changes of different fluorescence intensities relatively deep in living tissues, opened the possibility of performing in vivo studies for calcium dynamics in the mammalian kidney.6–8 Preferential use of rats in pharmacokinetic and pharmacodynamic studies emphasizes the importance of calcium monitoring in tissues of this model animal. To explore renal calcium dynamics, we have generated transgenic (TG) rats stably expressing a calcium indicator protein predominantly in kidney proximal tubules (PTs), and we used fluorescence microscopy to study changes in renal intracellular calcium levels. For efficient insertion of the transgene reporter construct into rat zygotes, we have used the hyperactive Sleeping Beauty transposon. This approach promoted the generation of TG rat founders at high frequencies9 and allowed selection of homozygous TG rats, which contained one copy of the transgene/haploid genome with a defined insertion pattern, with no major genetic or phenotypic alterations (see Concise Methods). For the intracellular fluorescent calcium indicator, we applied the genetically encoded calcium indicator (GCaMP2) construct, a genetically engineered calmodulin-based calcium sensor fused to a green fluorescent protein (GFP)–based fluorescent protein.10 Changes in light intensity emitted by this fluorescent protein can be directly used to determine changes in intracellular free calcium concentration. The GCaMP2 protein has already been applied in various in vivo measurements within selected tissue preparations and in transgenic mice.11–14 Although new versions of genetically engineered calcium indicators are also available, the GCaMP2 construct was reliably and efficiently working in our hands in various mammalian cellular systems. As reported,15 in human stem cells calcium imaging could be performed without the need for potentially toxic dye loading. In TG rats, the GCaMP2 calcium indicator expression was driven by a CAG promoter,16 which we previously applied for generating a calcium reporter system in human embryonic stem cells.15 In TG rats we found especially high GCaMP2 expression in renal PTE cells. For in vitro imaging we applied confocal microscopy, while for in vivo studies we used two-photon microscopy with multicolor detection and rapid response software capabilities (see Concise Methods). Kidneys of rats stably expressing the GCaMP2 indicator protein were examined by preparing frozen tissue slices and by establishing long-term cultures of dissociated cell types. In these preparations we examined GCaMP2 expression by anti-GFP antibody staining to bypass calcium-level dependent heterogeneity of the GCaMP2 signal. 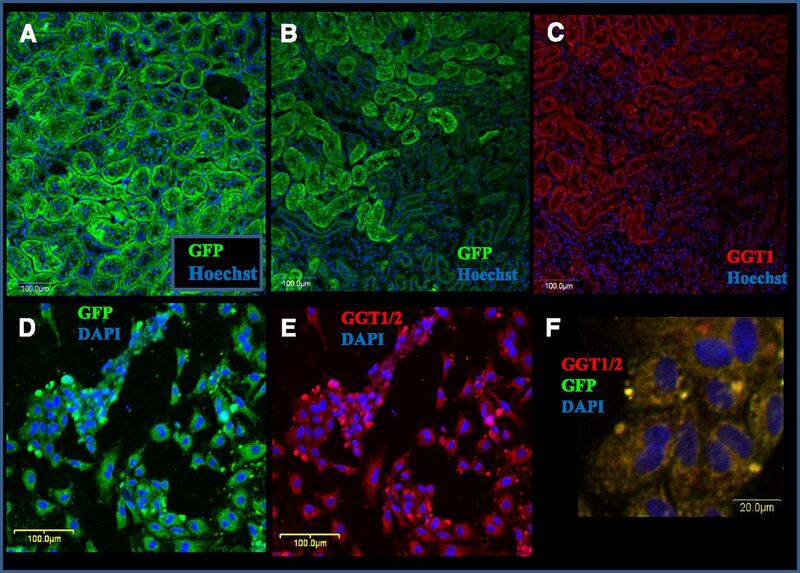 In frozen, fixed, and immunostained kidney sections, a relatively homogenous, high level GCaMP2 staining was found in PTE cells (Figure 1, A and B). This localization was also reinforced by costaining with γ-glutamyltranspeptidase 1 (GGT11), a marker of PTE cells (Figure 1C). As shown in immunostained kidney sections (Figure 1, B and C, Supplemental Figure 1, A and B), expression of both GCaMP2 and GGT1 was much lower in the glomeruli, the distal and collecting tubules, or the vascular tissues. GCaMP2 is expressed mainly in the kidney proximal tubules (PT). Characterization of GCaMP2 and expression of the PTE marker GGT1 by immunostaining in the transgenic rat kidney tissue slices (A–C) and in dissociated, cultured renal proximal tubular cells (D–F). Anti-GFP (green) and anti-CGT1 (red) immunostainings and nuclear DNA staining with Hoechst 33342 or DAPI (blue) are visualized in the panels. (A) GCaMP2 expression in PTs of the transgenic rat kidney visualized by GFP immunostaining (longitudinal section). (B) GCaMP2 expression in a horizontal section of transgenic rat kidney visualized by anti-GFP immunostaining and nuclear DNA staining. The PTs show a much higher level of GFP staining than other tubular structures or the glomeruli. (C) GGT1 expression in transgenic rat kidney in the same horizontal section as in B. GGT1 staining for PT epithelia closely correspond to GCaMP2 expression. (D) GCaMP2 expression in dissociated and cultured renal proximal tubular cells of transgenic rats. (E) GGT1 expression in dissociated and cultured renal proximal tubular cells of transgenic rats (the same slide area as in D), visualized by GGT1 immunostaining. (F) Colocalization of GCaMP2 and GGT1 in cultured renal proximal tubular cells. In immunostaining of isolated cultures of PTE cells, the GCaMP2 expression colocalized with markers of the PT epithelia, documented here by GGT1 costaining (Figure 1, D–F). PTE cells stained positive for ATP binding cassette transporter G2, a PTE marker (Supplemental Figure 1, D and E). In the following experiments fluorescence intensity changes of GCaMP2 were characterized in cultured PTE cells. As shown in Figure 2 and Supplemental Figure 2, addition of ATP, angiotensin II (AngII), trypsin, adrenaline, or histamine significantly increased cellular free calcium levels. At the end of each experiment we calibrated the calcium response by 5 µM ionomycin, producing maximum cellular calcium load, followed by the addition of excess EGTA, decreasing intracellular calcium to the minimum. We found that calcium release from PTE cells in calcium-free medium by the addition of the sarcoplasmic/endoplasmic reticulum Ca(2+)–dependent ATPase pump inhibitor thapsigargin+ATP induced a major calcium-induced calcium influx (Supplementary Figure 2D). 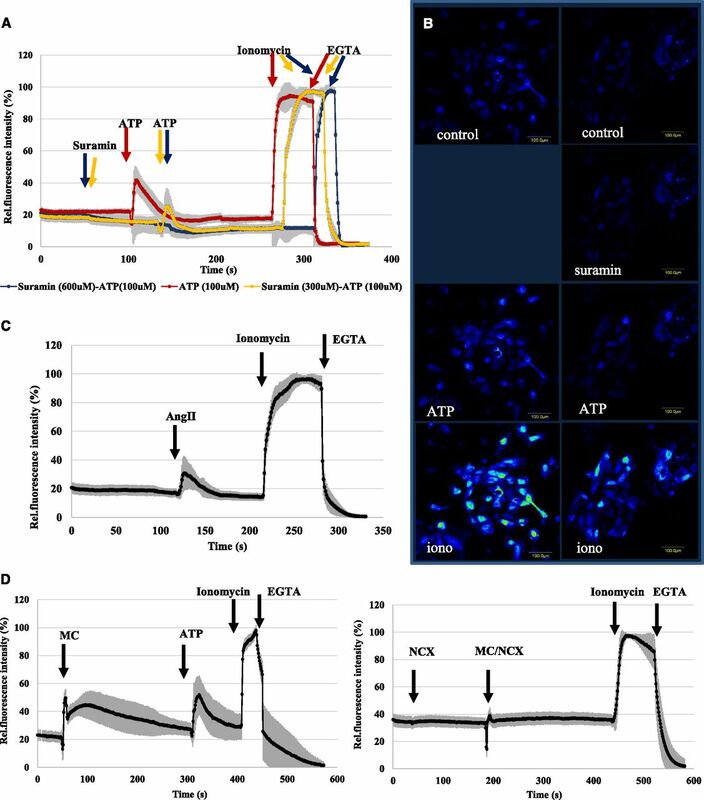 GCaMP2 reveals ATP, AngII, and experimental hypoxia/reoxygenation mediated calcium dynamics in isolated PTE cells and shows that these effects can be inhibited by specific blockers. (A and B) Effects of ATP 100 µM without pretreatment (red line) and after pretreatment with suramin 100 µM (yellow line) and 300 µM (blue line). (C) Effect of AngII 1 µM. (D and E) Effects of pretreatment with CoCl2 100 µM for 24 hours on the calcium-dependent cellular fluorescence. (D) Effect of medium change (MC) to normal medium and the addition of ATP (100 µM). (E) Effects of the addition of 300 nM KB-R7943, a specific inhibitor of the Na-Ca exchanger, followed by MC to normal medium (also containing 300 nM KB-R7943). The fluorescence data were normalized to a calibrated range of cellular calcium levels (Fmax-Fmin) (see Concise Methods). Data are mean (±SD) of 30 individual cells from three parallel experiments. As shown in Figure 2, A and B, addition of ATP (5–100 µM) produced a large increase in intracellular free calcium in PTE cells. A second ATP addition had no such effect (Supplemental Figure 2E), and pretreatment of the cells with suramin (200–600 µM), a P2 purinergic receptor inhibitor, eliminated ATP-induced calcium signal (Figure 2, A and B). These findings indicate calcium signaling through P2 purinergic receptors in PTE cells. We found that AngII (10 µM) induced a measurable calcium signal in isolated PTE cells, although the amplitude of calcium transients detected in individual cells showed high diversity (Figure 2C). Repeated AngII addition did not cause repeated calcium effects, and the specific inhibitor of angiotensin receptor type 1 (AT1), active form of candesartan (1 µM),17 fully blocked AngII-induced calcium response (not shown). In various kidney diseases and in the process of kidney transplantation, ischemia and reperfusion cause substantial damage in the PTs, especially by changing calcium homeostasis.3 In an attempt to mimic ischemia (hypoxia) and reperfusion (reoxygenation) in isolated renal PTE cells, we have pretreated the cells in media containing 200 µM CoCl2, reported to cause hypoxic conditions in various cell types in vitro.18,19 After 24 hours' pretreatment, exchange of the media for oxygenated media containing no CoCl2 resulted in a large transient increase in cellular calcium levels, while addition of ATP still produced a rapid calcium rise (Figure 2D). The exchange of media without CoCl2 pretreatment did not alter intracellular calcium levels (Supplemental Figure 2F). Because data in the literature indicate that reperfusion may cause a large calcium influx in renal PTE cells because of the reverse operation of the Na-Ca exchanger (NCX),20,21 we tested the effect of a powerful inhibitor of the NCX, KB-R7943,22 on this process. As shown in Figure 2E, addition of KB-R7943 in CoCl2-pretreated PTE cells slightly increased the basal calcium levels while eliminating the rise in calcium due to reoxygenation. In these experiments we examined calcium alterations in the rat kidney PTs by using two-photon microscopy (see Concise Methods). For examining renal blood flow and cellular calcium changes simultaneously, intraarterial injection of a 70-kDa large-molecule rhodamine-dextran conjugate (RDC) was applied. This material is preferentially retained in the renal blood circulation, but slow filtration and tubular passage can also be followed.1,23 For two-photon imaging of cortical areas containing mostly PTs (Supplemental Figure 3, A and B), or deeper regions containing glomeruli and other tubular structures (Supplemental Figure 3, C and D, Supplemental Video 1) were selected. Figure 3A shows the renal PT baseline intracellular calcium levels visualized by GCaMP2 fluorescence, in relatively large kidney cortex areas. Of note, despite the relatively homogeneous GCaMP2 expression in the PTs (Figure 1), different PT areas showed different GCaMP2 fluorescence. In vivo two-photon measurements of the GCaMP2 expressing rat kidneys show significant heterogeneity in PT basal fluorescence and enable the detection of spontaneous calcium oscillations in PTE cells. (A) Renal PT basic cellular calcium levels reflected by GCaMP2 fluorescence in relatively large kidney cortex areas (TG rats). Comparisons were made to control, wild-type (WT) animals. Higher magnification of PTs of the transgenic rat kidney (GCaMP2 fluorescence, green; nuclei Hoechst 33342, blue; artificially colored and rhodamine-dextran fluorescence, red). (B) In vivo calcium oscillations in the neighboring PTE cells with temporally and spatially variable frequency (Supplemental Video 1). These oscillations are compared with small changes in fluorescence in the respective cellular areas in the control (WT) animals. To assess PT regions connected within one nephron, we followed the low-level appearance of the circulating RDC in the tubular structures. As shown in Supplemental Figure 4, A and B, and Supplemental Video 2, the movement of the intratubularly-appearing RDC filtrate indicated tubular areas belonging to one nephron. In PTE cells a spontaneous calcium-dependent fluorescence oscillation was observed. As shown in Figure 3B and in Supplemental Video 3, in neighboring PTE cells this calcium oscillation had a variable frequency, between 3 and 10 mHz. Thus, this oscillation was probably not caused by some artificial effect (such as the animal's heartbeat or breathing or external noise) but rather represents an inherent calcium oscillation in PTE cells. In the following experiments we studied the in vivo effects of potential ligands and inhibitors. Figure 4, A and B, show GCaMP2 fluorescence changes following intraarterial addition of 3.25 mg/kg ATP (a final blood concentration of about 100 µM). ATP induced a rapid, high-level increase in PT cellular calcium, which required several minutes to return to the baseline levels. This ATP-induced calcium wave could be significantly reduced by a 5-minute pretreatment of suramin (25 mg/kg; final blood concentration, approximately 300 µM), which in itself had no measurable effect on PT calcium levels. The administration of ATP caused a receptor desensitization, in which no effect was observed after a second addition of ATP (Supplemental Figure 5). In vivo GCaMP2 fluorescence changes in the renal proximal tubular cells show the elevation of calcium level after intraarterial addition of ATP and AngII—these effects are blocked by the respective receptor inhibitors. 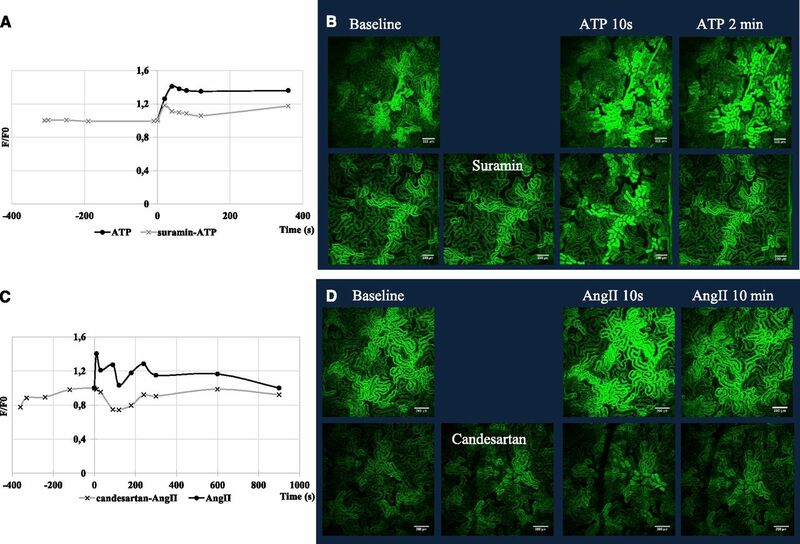 (A and B) GCaMP2 fluorescence changes after the intraarterial addition of ATP 3.25 mg/kg (100 µM)—effect of 5-minute pretreatment with suramin 25 mg/kg (300 µM). (C and D) GCaMP2 fluorescence changes after the intraarterial addition of AngII 50 µg/kg (0.75 µM)—effect of 5-minute pretreatment with 28 µg/kg candesartan (1 µM). Figure 4, C and D, show the in vivo effect of intraarterial addition of AngII on PT cellular calcium levels. As shown, AngII, 50 µg/kg (about 0.75 µM final blood concentration), caused a major, rapid increase in PT cellular calcium, which was declining to a baseline level within several minutes. Short pretreatment with 1 µM (28 µg/kg) candesartan eliminated AngII-induced calcium response, while irregular fluctuations in baseline calcium levels were detected. To evoke in vivo experimental renal ischemia-reperfusion, kidney vessels were clamped in anesthetized animals; after 30 minutes clamps were carefully removed to allow the restoration of renal blood flow. Similar experiments were also performed in the presence of the rhodamine-dextran in the circulating blood (this did not significantly affect calcium signals). After the experiments animals were euthanized and the renal PT cellular calcium levels increased to a maximum level, providing a calibration possibility (Supplemental Figure 6). These in vivo renal ischemia-reperfusion experiments required several repetitions, and representative experiments, performed in at least three animals, are shown in Figure 5, A and B. Clamping of the renal vessels induced a rapid increase in PT cellular calcium levels, and a restoration of the cellular calcium levels occurred during the following minutes. PT calcium concentrations usually reached the baseline calcium levels before the end of the ischemic period (30 minutes). After the removal of the clamps, again a rapid, significant increase in the PT cellular calcium levels was observed, which was also decreasing in time (Figure 5, A–C). Thus, both ischemia and reperfusion evoked major changes in PT cellular calcium. In vivo calcium dynamics under ischemia/reperfusion can be influenced by the AT1 antagonist candesartan and by the NCX inhibitor KB-R7943, but not by the P2 purinergic receptor inhibitor suramin. (A–C) Control (bold) lines: Clamping of the renal blood vessels induces a major calcium peak in the PT cells, slowly decreasing to baseline level. Reperfusion (removing the clamp) induces a second calcium wave. (A) In vivo effect of 5-minute pretreatment with 28 µg/kg candesartan (1 µM), an AT1 inhibitor, on the PT calcium levels during ischemia and reperfusion. 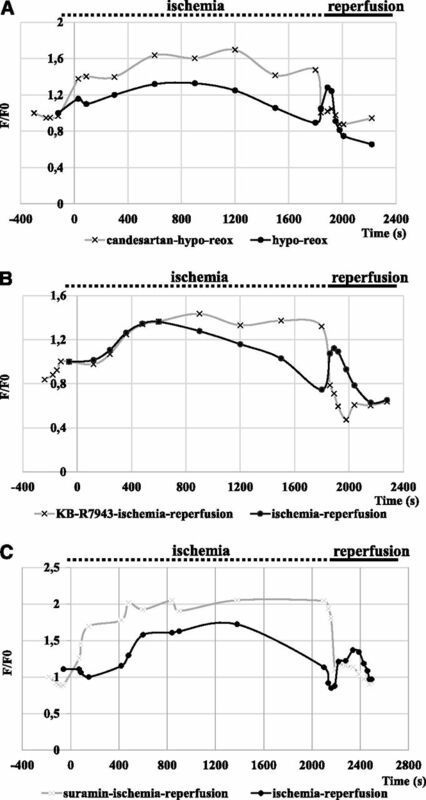 (B) In vivo effect of 5-minute pretreatment with 8.0 µg/kg KB-R7943 (300 nM), an Na-Ca exchanger inhibitor, on the PT calcium levels during ischemia and reperfusion. (C) In vivo effect of 5-minute pretreatment with 25 mg/kg (300 µM) suramin, a P2 purinergic receptor inhibitor, on the PT calcium levels during ischemia and reperfusion. In the following experiments we examined the effects of various drugs on the PTE cell calcium changes during ischemia-reperfusion. When the animals were pretreated with the AT1 inhibitor candesartan (1 µM), the calcium peak after renal blood vessel clamping was similar to that in the controls, while the second calcium wave, caused by reperfusion, was significantly reduced (Figure 5A). Addition of the P2 receptor inhibitor suramin before ischemia did not significantly affect the first or second calcium peak in ischemia-reperfusion (Figure 5C). Because data in the literature indicate that reperfusion in renal PTE cells may cause a large calcium influx as a result of the reverse operation of the NCX,20,21 we explored the effect of an efficient inhibitor of this transporter, KB-R7943,22 on in vivo calcium signals evoked by ischemia-reperfusion. This agent, at a dose of 8.0 µg/kg (final blood concentration, approximately 300 nM) did not significantly affect the baseline PT calcium levels (Figure 5B). However, the calcium peak evoked by ischemia was somewhat increased and prolonged, while the calcium wave caused by reperfusion was practically absent. The laboratory rat has long been the preferred animal model for most physiology, pharmacology, and toxicology studies. Recently a large number of rat strains have been developed as experimental models for specific diseases. In the present study we established the first rat model expressing the GCaMP2 calcium indicator protein at an exceptionally high level in kidney PTs. As demonstrated here, the GCaMP2 can properly be used to study in vivo kidney calcium physiology with relatively slow changes in calcium levels. However, the genetically encoded calcium indicator technology is developing rapidly, and GCaMP indicators with higher fluorescence yield and greater dynamic range are now available. These indicators reliably detect rapid calcium transients in various neural cell types in vivo.24–26 Using cultured PTE cells, we performed in vitro confocal microscopy studies; using two-photon microscopy, we examined the in vivo calcium modulations in renal PT cells. The in vitro experiments properly identified the cell types examined and allowed a detailed, properly calibrated examination of the effects of ligands and potential inhibitors on the PT epithelial cellular calcium levels. Through the in vivo two-photon microscopy studies we could study heretofore unexplored features of renal tubular calcium dynamics. The PT is especially important for nephrotoxicity studies because active secretion and reabsorption of drugs and metabolites occur primarily in these areas. The high energy demand of these cells makes them especially vulnerable for ischemia. Both the in vitro and in vivo studies presented here provided important information regarding the calcium response of PTE cells to physiologically relevant ligands, such as ATP and AngII; drugs, including suramin and candesartan; and pathologic conditions, especially ischemia-reperfusion–induced renal injury. Nucleotides have a major role in modifying kidney function through P2 type receptors.3,27,28 Here we show that ATP induces a major, temporary calcium increase in renal PTE cells, followed by desensitization. Pretreatment with suramin, a P2 purinergic receptor inhibitor, eliminated the calcium signal evoked by ATP both in vitro and in vivo. These findings support a major calcium response in PTE cells through P2 purinergic receptors. According to the literature, the major purinergic receptor types in PTE cells are P2Y1, 2, 4, and 6, as well as P2X4 and 6.29 Exact characterization of the receptor types involved in the effects of different nucleotides and their specific inhibitors in PTE cells needs further exploration. Several physiologic and pathologic kidney responses are based on the action of intrarenal and circulating AngII, through specific receptors both in kidney vessels and PTE cells.30 Indeed, in our experiments, AngII induced a transient calcium signal in the renal PTE cells both in vitro and in vivo. This signal most probably occurred through the activation of the PIP2-IP3 pathway by the AT1 because short pretreatment with candesartan, a specific inhibitor of AT1,31 eliminated the AngII-induced calcium response (Figure 4C). In the in vitro studies we examined the effects of several ligands and drugs in isolated PTE cells and performed model experiments for mimicking ischemia and reperfusion. When applying in vivo two-photon microscopy, we revealed intrarenal calcium dynamics during physiologic as well as pathologic conditions, including renal ischemia and reperfusion. The live rat renal PTE cells showed a spontaneous individual oscillation of the intracellular free calcium concentration. Similar oscillations consisting two superimposed components were detected by Peti-Peterdi et al. in proximal and distal tubule cells by loading with a red calcium fluorophore, Rhod-2 AM.2 It was hypothesized that the slower component of the oscillation originates from the tubular fluid flow rates regulated by the tubuloglomerular feedback, while the faster one originates from myogenic vasoconstriction of the afferent arteriole. Moreover, despite the relatively homogenous distribution of GCaMP2 protein in PTE cells, as documented by immunostaining (Figure 1), the in vivo calcium-dependent fluorescence showed remarkable differences in different cortical PT areas. The rhodamine filtration experiments suggested that these areas belong to individual nephrons, and the cellular calcium may reflect the activity of nephrons controlled by the tubulo-glomerular feedback. When following in vivo PT cellular calcium levels by the calcium indicator protein, we observed remarkable calcium changes both under ischemia and after reperfusion of the kidney. Because PT calcium waves could also be evoked by ATP or AngII, we examined the potential role of these endogenous ligands in this phenomenon. We found that a general blockade of P2 receptors did not have a major effect on ischemia-reperfusion–induced cellular calcium changes (not shown). In contrast, the selective blockade of AT1 significantly decreased the reperfusion-induced cellular calcium increase. AT1 is more abundantly expressed in the kidney endothelial cells32; thus, the simultaneous blockade of these receptors may also affect PT calcium changes. Our experiments, measuring renal PT calcium changes in vivo, strongly support the presence of this phenomenon during reperfusion. Pretreatment of the animal with low concentrations of the NCX inhibitor KB-R794322 slightly increased and prolonged the PT cellular calcium increase during ischemia and decreased the rapid calcium accumulation after reperfusion, supposedly by blocking the reverse operation of the NCX. In these experiments we had to select KB-R7943 concentrations (<1 µM) not affecting the heart of the animal. Because renal calcium alterations through voltage-dependent or other calcium channels may also be involved in ischemia-reperfusion,34 further studies are needed to explore additional pathways. In summary, the experiments reported here document applicability of the TG rat expressing the GCaMP2 calcium indicator protein for studying physiologic and pathologic alterations of free calcium in renal PTE cells. By applying this animal model in combination with an advanced imaging approach, we provide information for the underlying pathomechanism of ischemia-reperfusion and its potential pharmacologic modulation. The Hungarian Animal Health and Animal Welfare Directorate approved all animal protocols according to the European Union’s directives. Tissues were frozen in isopentane immediately after dissection and then cut with a cryostat into 5-µm thin sections. For the detailed staining protocols see the Supplemental Material. Wild-type tissues were used as negative controls for GFP staining, and secondary antibody controls were used to detect nonspecific binding of the secondary antibodies. Immunohistochemistry images were examined by an Olympus FV500-IX confocal laser scanning microscope. Five-day-old cultures of primary cells isolated from kidney cortex were incubated with 10 mM EGTA for 5 minutes before fixation with methanol and being washed with PBS. Blocking and immunostaining were performed as described above for the tissue slices; nuclei were stained with DAPI. Secondary antibody controls were used, and image detection was performed as described above. Primary PTE cell cultures were established from kidney cortex as described in detail in the Supplemental Material. Tubular cells in 500-µl RPMI were plated onto eight-well Nunc Lab-Tek II Chambered Coverglass (Nalgen Nunc International, Rochester, NY) covered with rat collagen (type I solution from rat tail; Sigma-Aldrich, St. Louis, MO), and culture media were changed every second day. The PTE cell phenotype was routinely verified by monitoring morphology and γ-glutamyl transpeptidase (GGT1/2; Santa Cruz Biotechnology, Santa Cruz, CA) expression. For measuring cellular calcium, GCaMP2 expressing primary rat PTE cells were seeded onto eight-well Nunc Lab-Tek II Chambered Coverglass covered by 0.01% collagen solution, type I from rat tail (C3867; Sigma-Aldrich). Culture media was removed by changing the medium to Hanks balanced salt solution. Calcium signals were initiated by various ligands (see main text and figure legends), and ligand or inhibitor concentrations were chosen according to the literature. For calibration procedures, ionomycin 5 µM and then EGTA were used in five times excess of calcium concentration in the medium.36 To simulate hypoxic conditions in vitro, CoCl2 200 µM was added to the cultures in 500-µl phenol-red free RPMI completed with 3% penicillin/streptomycin, 1% l-glutamine, and 20% FBS. Calcium signal measurements were carried out by following time-lapse sequences of cellular fluorescence recordings, and images were analyzed with FluoView Tiempo software, version 4.3 (Olympus). For GCaMP2 imaging, cells were excited with the 488-nm laser line and emission was measured between 505 and 535 nm. All in vivo experiments were performed according to the Committee on the Care and Use of Laboratory Animals of the Council on Animal Care at the Semmelweis University of Budapest, Hungary (22.1/3491/003/2008). For two-photon imaging, the animals were anesthetized with a combination of ketamine (100 mg/kg) and xylazine (10 mg/kg). The trachea and the carotid artery were cannulated for stable respiration and treatment purposes. An incision was made on the left flank of the animal, and the left kidney was exteriorized, secured for measurement, and placed on a glass coverslip above the objective. The kidneys were continuously bathed in warm 0.9% saline during the imaging. For visualization of intrarenal blood flow and the cellular calcium changes simultaneously, the animals were treated with intraarterial injection of 70-kDa rhodamine-dextran (D-1841; Life Technologies, Budapest, Hungary). Images and videos were acquired using a FEMTO2D high-sensitivity galvanoscanner-based inverted two-photon microscope system (Femtonics Ltd., Budapest, Hungary). Observations were made using an UPLSAPO 10× air immersion objective (N.A. 0.4) and UPLSAPO 60× oil immersion objective (N.A. 1.35). Excitation was provided by Mai Tai DeepSee femtosecond pulsing titanium-sapphire deep see laser (SpectraPhysics, Mountain View, CA). Images were collected by two non-descanned photomultiplier tube detectors at two spectral ranges (490–560 nm and 600–700 nm). For measuring GCaMP2 signals, an excitation wavelength of 910 nm was used; for the simultaneous measurements of rhodamine and GCaMP2 fluorescence, an excitation wavelength of 850 nm was used. Hoechst was excited at 720 nm. Images and data volumes were processed using the MATLAB-based MES software (Femtonics Ltd.) and ImageJ software (National Institutes of Health, Bethesda, MD). All experiments presented in this paper were performed in at least three to five independent tissue preparations or three to five transgenic animals. The authors are grateful to Irén Bodrogi-Mayer, Anita Hídvégi, Gabriella Szoták, and Katalin Parragné Derecskei for their excellent technical assistance. The active form of the AT1 inhibitor candesartan was kindly provided by László Hunyadi. This work was supported by the Hungarian Scientific Research Fund (grant numbers NK83533, K101064, K84173, K-108688, and PD101733), the National Development Agency (grant numbers KTIA_AIK_12-1-2012-0025, KTIA_AIK_12-1-2013-0041, TÁMOP 4.2.1.B-09/1/KMR-2010-0001, and KMR_12-1-2012-0112), and SE-MTA Lendület (grant number LP2001-008/2011). Á.A. and B.S. contributed equally to this work. This article contains supplemental material online at http://jasn.asnjournals.org/lookup/suppl/doi:10.1681/ASN.2014070705/-/DCSupplemental.